Patient Access is not just for booking GP appointments; you can also order repeat prescriptions. 1) You can visit the surgery and let one of our receptionists know that you would like to use this service. Please bring with you photo ID and one of our receptionists will then hand you a letter giving you all the information you need to register on line. Once you have this letter then please click the link below and follow the on screen instructions to register. Click here for more information, to sign in or to register. You are now able to to view and download a coded summary of your medical record online. This includes Medications, Allergies, Immunisation, Problems, Consultations and Test Results. Please note: If you wish to register for access to your core or your detailed coded record you must complete a consent form. Please call into Surgery to pick up this form, we can then process your request. 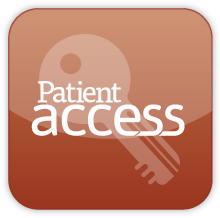 Please note that Patient Messaging through Patient Access is NOT enabled. Please contact the Surgery if you have any queries, this enables us to process them more efficiently. All existing Patient Access service capabilities (booking appointments, ordering repeat medication, viewing of medical record and messaging your practice) will continue to be available in the new version, with changes focussed on making using these capabilities more intuitive and user friendly.